This vegan recipe for steamed dumplings is really versatile and can be adapted to make the most of in seasonal ingredients. 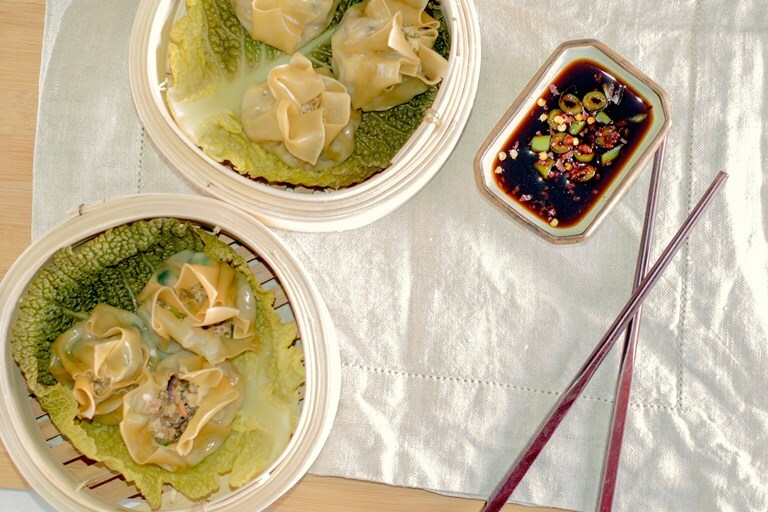 Perfect as part of an Asian feast, these tofu dumplings are sure to impress. Chinese dumplings are fun and easy to make. Whilst you can easily buy frozen ready made dumplings, it is rather nice knowing what is in them, and being able to adjust with seasonal ingredients is always a plus. When you are planning a dumpling party, you’ll want several varieties. We’ve previously made gochujang spiced butternut and mushroom dumplings, but wanted to try making siu mai (shumai) style dumplings. These are easy to make as they are left open so you do not need to be a master of neat folding. Most often, siu mai are filled with meat or seafood fillings. We wanted a vegan version. The thing about these open dumplings is they need a more solid filling, so we’ve added cornflour to thicken the mixture. If you are not vegan you could use an egg white instead. Essentially you want the mixture to set a little as it cooks. For these open dumplings you will need to use square wrappers (wonton wrappers will work well) rather than the circular dumpling/gyoza wrappers. They are readily available from Chinese food shops. The dumplings are best steamed fresh, but the uncooked dumplings can be frozen once wrapped, then steamed directly from frozen in the same way – just increase the cooking time accordingly.